Last year, the Anster offered to rebuild my pantry as my birthday present. It was a great idea as my current pantry was a mix-match of shelves at different heights. It worked much better than the previous version which involved banana boxes stacked one upon the other. I was forever stacking and re-stacking boxes when the ingredients I required were in the bottom box. I didn’t need much encouragement to empty my pantry – stuff got piled into boxes without much organisation. With the old shelves removed, the walls and ceilings plastered, sanded and painted, it was exciting to think that soon I’d have pristine shelves just the right height. As usual, in our renovation process, as soon as a new project is begun, work (real work not renovation work) gets busy and the project grinds to a halt. I got sick of cheat cooking using jars of pre-made sauces, so I delved into my boxes and re-sorted them so I could at least find the most-often used ingredients. I made a little pantry by emptying out a bookcase. I probably resorted those boxes at least once a week but I couldn’t find my chai spice blend. I was almost at the point of re-buying the spices so I could make up another batch when the weather threw a rain storm my way. Bad weather means The Anster can’t go tramping (hiking) and so we get some building, painting & renovation work done instead. Anyhow, the pantry is done and I found my chai spice blend. So I got to and baked some more muffins. These muffins can be made with a fresh mango or tinned mango slices (drained of syrup). Preheat oven to 180°C. Line a 12 muffin hole tray with muffin papers. Sift flour, sugar, baking powder and spice blend into a bowl. Stir in coconut. Whisk together the olive oil, egg and coconut milk. Add the fresh mango to the flour mixture and toss gently to coat the fruit pieces in flour. Combine extra chai spice blend with the two sugars then sprinkle over top of the muffins. Bake 200ºC for about 15 minutes or until the muffins are cooked. Let the muffins cool for 5 minutes then remove to a wire rack to cool completely. Best eaten within a day of making. - Use a neutral flavoured oil such as rich bran oil and 1 teaspoon of vanilla extract if you don't have vanilla-infused olive oil. - If using tinned mangoes, drain them well and reserve syrup for another use. - These muffins also work well with freshly diced apple in place of the mango. 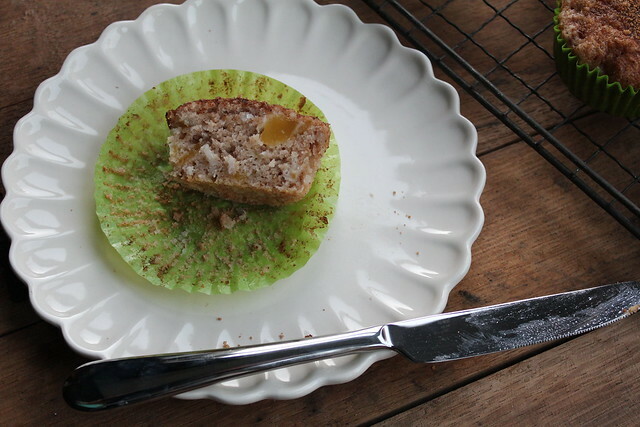 This entry was posted in Muffins and tagged chai spice blend, fresh mango muffins, mango muffins, mango muffins with chai & coconut, muffins by Jo Dohrman. Bookmark the permalink.